"They came in from here," says Sanjay Taunk, pointing to the door through which burglars entered his home in the South East of England in September and stole his wife's gold jewellery. They took nothing else. Burglaries of Indian homes, according to local councillors and residents, have become increasingly common in this town that is less than an hour's journey by train from London. Indian homes are more vulnerable across the United Kingdom, according to the police, because Indian families are known to own gold jewellery, which they often keep at home - police have . Mr Taunk lives in Milton Keynes, which, over the last few years, has seen an influx of immigrants - many of them Indians, employed by software or financial firms. They find it convenient to live here and travel to London for work. "My daughter had the key for the house since I was in London for work," Mr Taunk told the BBC. "As soon as she came in, she saw that all the doors were open and in the study, everything was opened - all the drawers and cupboards." "It does seem to be a rising trend," says councillor Edith Bald, who has been looking into robberies in her ward in Milton Keynes. In September alone, she adds, an average of two Indian homes were burgled every week. "That is higher than the national average and higher than the average for Milton Keynes," she adds. Last year, there were 3,463 offences where gold jewellery was stolen from South Asian - Indian, Pakistani and Bangladeshi - families living in London. The police in Milton Keynes declined to comment but the London metropolitan police estimates that roughly £50m ($67m) worth of jewellery was stolen from South Asian, mostly Indian, homes in London alone during the last financial year. "Wearing a chain, which represents marriage, wearing a ring, a couple of bangles, earrings, these are all part of our culture," says Geetha Morla, a Milton Keynes resident and councillor. whose home was burgled recently. "We have to help ourselves if no one else can help us." Some residents have taken expensive steps to prevent burglaries. 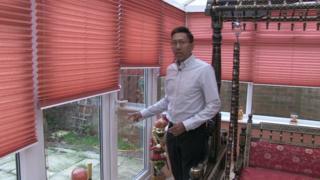 Rabi Sankar Chowdhary has spent hundreds of pounds on a 24-hour security system. "Once there is a break-in, an alarm will go off and I will get a call from a monitoring station and I will be sent a photograph of the person who has entered my property," he says. "I will be contacted and if they cannot contact me, they will contact others in my family."